There is a real irony to this post. I am writing it while trying to shake off the mother of all colds (I’m not one to throw the word flu around lightly, but I am starting to consider it these days). After a full on, mad busy but very exciting, January, I was all set to easy more gently into February. And then we all started dropping like flies. A week in and we are still no better, it may be time to consider some alternative therapies to get us back on our feet. Last year I wrote about whether Chicken Soup can really cure a cold which lead on to a lot of discussion about certain old wives tales that people turn to when they feel a cold coming on. But is there really any science to back these practices up or are they just a lot of tall tales? There seems to be some scientific backing for the use of chicken soup to help a cold. It probably won’t cure it but it may help alleviate the symptoms and perhaps even clear it up a little quicker. Various studies have shown three promising elements to chicken soup. 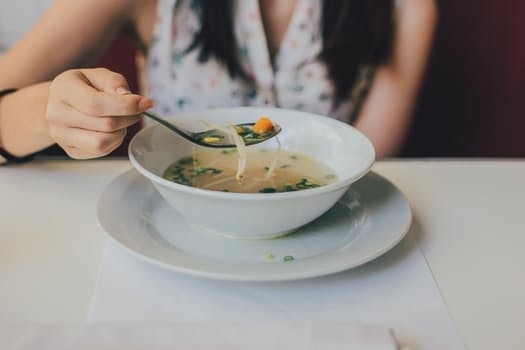 Firstly, it reduced the movement of certain white blood cells, called neutrophils, that travel to the area of infection; these cells fight the infection but can also cause inflammation and a build up of mucus – so chicken soup may help alleviate these symptoms. Secondly, chicken soup may thin the mucus that does build up with a cold, allow it to clear from the body more easily. A study compared the viscosity of mucus in cold sufferers that drank cold water, hot water and chicken soup and the soup came out a clear winner. Thirdly, an anti-inflammatory compound called CARNOSINE has been found in chicken soup. You can find plenty of stories telling you how well this works and how it has been used in a family for generations but I am afraid I couldn’t find any science to back it up. Actually that is probably just as well as I don’t think I would fancy putting on cold wet socks before bed. There are a few variations in this one; Wet a pair of (white!) socks and wear to bed; wet a pair of (white socks) and cover with dry woollen socks and head straight to bed and wet a pair of socks, then PUT THEM IN THE FREEZER until they are good and cold and then put them on and go to bed. The thinking behind this one is that the cold feet cause the blood vessels to restrict (yep!) and move blood to other areas of the body that needs it (no!) and then when the feet heat up they draw the blood back and this cycle continues for the night and strengthens the immune system. This one definitely goes in the fiction pile. Other theories on how this one work include the fact that the cold feet draw the infection out or that this method induced a fever in the body which kills off the infections. Another No and No! This one takes the wet socks thing to another level. Slice up a raw onion and place in along the soles of your feet, covering with socks to keep in place. At least the socks are not wet this time. The theory is that onions attract microorganisms and absorb them. The onions apparently draw the infection out of your body through your feet. There is no scientific research, that I can find, to back any of this up. The other suggestions are to put a sliced onion under your bed sheets as you sleep or cut up an onion and place it on a plate anywhere in the room. I’m afraid this cannot provide a magic fix as these remedies claim, they are not magnets for viruses and bacteria. Although onions are not much good outside the body, they may indeed have some role to play inside the body. There are suggestions that eating onions can cure a cold or at least improve some of the symptoms and there is some science to back this one up. The lore also mentions eating raw garlic, which has probably had more scientific study than the onions. 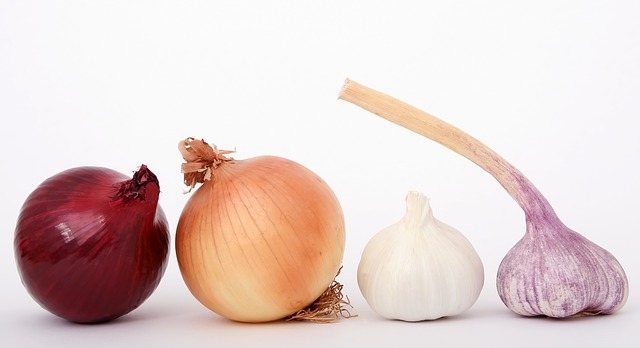 Eating onions or garlic is thought to work better as a prevention rather than a cure. They are best eaten raw – ideally chopped up or minced and then left for 15 minutes. It is thought that certain compounds in raw garlic boost the body’s natural supply of hydrogen sulphide (toxic at high level but acts as an antioxidant within the body). Allicin is one of the main active agents found in garlic, it is produced when an enzyme called allinase breaks down a compound called alliin and it has antimicrobial properties. The earliest mention of garlic for medicinal use dates back to … 6th century BC. Garlic is thought to have many medicinal properties and has been linked with prevention or curing cancer, certain heart diseases and other ailments. Interesting fact… the ancient Greeks were supposed to have fed raw garlic to their Olympian athletes to increase their stamina! When we are ill we often lose our appetite; once we are taking enough fluid and eating when we can then there is no need to force food or starve the body. 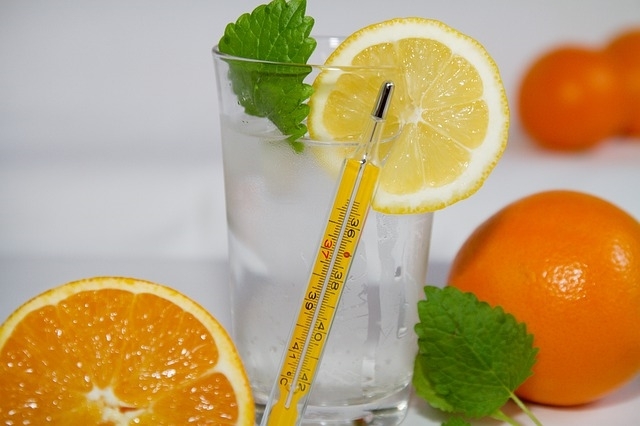 Although vitamin C is good for the body and can play a role in maintaining a healthy immune system it does not have the ability to keep a cold at bay, as once thought. A number of studies have shown that taking high doses of vitamin C will not reduce your chances of getting a cold, although one study reported a possible improvement in people who were under severe stress. Vitamin C may help alleviate the symptoms of a cold somewhat, it is necessary for a healthy immune system and it can have anti- inflammatory propertied but, unfortunately it is not the miracle it was once touted to be. It was first proposed as a ‘cure all’ by Nobel Laureate Linus Pauling in the 60s. He even wrote a book on how taking large doses of vitamin C can protect against infection from a cold virus. Unfortunately Paulings claims have not stood up to the rigors of scientific investigation. There may be some sense to this claim. Firstly, colds are a lot more prevalent in colder months; one reason could be that rhinovirus, a common cause of many colds, can thrive in colder conditions, so even breathing cold air into our upper respiratory tract can promote its development. BUT this only applies when the virus is already in your system. Also, it has been shown that our immune system can be weakened by a drop in body temperature. This certainly doesn’t mean that everyone should stay indoors for the Winter, getting outside and keeping active and healthy is our best line of defence. Just wear the right clothing when you do! Honey is thought to have antiviral and antibacterial properties. It is unlikely however to cure your cold. It may go some way towards alleviating the symptoms and soothing a raw throat. Eating it in excess will only load the body full of sugars though, not so good for maintaining a health immune system. This used to be a thing until very recently. Even doctors would check the colour of your ‘snot’ to determine what kind of infection you have. As colds are caused by viruses and these do little to alter the colour of the body’s mucus, this one actually bears little weight. Change in mucus colour could simply be down to something you ate, or other chemicals in your body. Some of the ideas mentioned above may reduce the length of your cold slightly, or may help alleviate some of the symptoms but most colds will run their course in their own time anyway, whether treated or not. Many of the home remedies people try can be as effective as over the counter drugs, which are often of no great use either. If it has been handed down for generations in your family, it is safe and it works for you, keep doing it! Fact: Children get an average of six to eight colds a year; Adults get an average of three to four colds a year. Have you any old wives tales for curing a common cold? If so, I’d love to hear it, just share it in the comments below. In the mean time I am off to boil up some chicken soup with extra onions and garlic in the hope that we will all be better soon. I was in the Orient for a number of years. In Vietnam the have the chicken soup tradition too. They have another of others which are a bit stranger though. Newborns don’t leave the house for 90(i believe it was 90) days after birth. I have heard of the 90 day tradition, plus I think they often have someone to come and care for the mum and family during that time, is that right? I’d never heard the one about the wet socks before – you won’t find me trying that in a hurry! The only thing I find works around here (where children have no interest in eating chicken soup) is Vicks on the feet at bedtime. That really seems to help when they’re congested or have a cough. Oh interesting, I had only heard of the Vicks on the chest. I love hearing all the different things people do, thanks Christine. My goal with colds is never to “cure” it, just to eat enough soup and do whatever it takes to feel human while I’m sick. Love this article, tips and fact/fiction all in one! That’s a very clever approach Kat! We really can’t do much to cure the colds so may as well be as comfortable as possible while we have them I suppose!